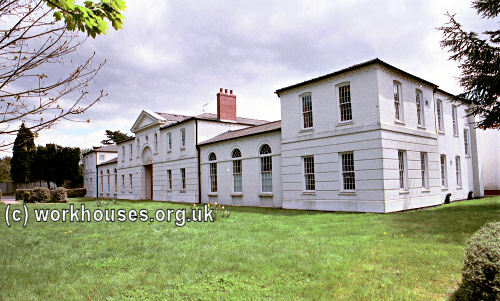 Horsham's parish workhouse was established in 1727 near the parish church, on the south side of Normandy. In 1842, the site was taken over to become St. Mary's almshouses. Warnham had a parish workhouse from about 1730, located in some former almshouses. They were sold off in four lots in 1840 after the opening of the Horsham Union workhouse, then demolished to make way for two blocks of estate cottages between 1855 and 1876. A parliamentary report of 1777 recorded parish workhouses in operation in Horsham Borough (for up to 80 inmates), Ifield (20), Itchingfield (4), Beeding (14), Rusper (40), Shipley (26), Slynfold (13), Warnham (20), and West Grinstead (30). Ifield had a parish workhouse on Tweed Lane, Ifield Green. Ifield former parish workhouse, 2004. Shipley's first parish workhouse may have been Renche's Farmhouse near Dragons Green. However, by the early nineteenth century, it had moved to a building at the west side of Pound Lane, said be capable of housing up to 80 inmates. The premises still exist, now known as Whitehart Cottages, formerly Workhouse Cottages. The location is shown on the 1875 map below. Shipley former parish workhouse on Pound Lane, 2014. When any person is turned out of the house for misconduct, he shall not be re-admitted without the recommendation of the Jenteel Vestry, but he shall sleep in the Black Hole or dark room, but not remain on the premises in the daytime. No ale, wine, brandy, gin, or other spiriteuse liquors shall be brought into the house. That if any person shall brawl, quarrel or fight, or use bad language, the offender shall lose one meal at the first offense, one days meals at the second offense, and shall be confined in the Black Hole for the third offense. Any pauper found begging alms shall be punished as ordered by the Vestry. Beds shall be made at 9 o'clock; rooms washed once a week, oftener if necessary, selecting a dry day for the purpose. Proper fires shall be kept in the day rooms. That all the house paupers that can be spared and are able shall be sent regularly, decently and cleanly to church every Sunday with the Governor or Governess. That the men and women shall on no account sleep in the same room except, by special permission, being married persons. That no one shall be allowed to smoke except in the day room, and the Governor do in future take away pipes and tobacco from anyone disobeying this order. Proper servants of any description shall be furnished amongst the persons in the house. That any female being in the family way shall be degraded by wearing a party coloured or workhouse dress as ordered by the Select Vestry. In 1830, the population of Shipley in 1830 was 1,180, 46 of whom were inmates in the workhouse. At the same date, 113 families were in receipt of out-relief which was distributed at the church door every Sunday. The rates of pay to persons hired out of the workhouse for labour were agreed by the Vestry as follows: "That boys hired out of the poorhouse for labour on the respective farms are to be paid in the following manner: All under 12 years, 4d. per diem; over 12 years and under 15 years, 6d. per diem; above 15 years old, 9d. per diem; old men, 12d. per diem." The Vestry also resolved "That the people employed by the parish are in future to find their owne tools, excepting bars, malls and pikes for stone digging." In 1833, a fine house called New Buildings Place, then untenanted, was taken over by the parish to house additional paupers. However, the inmates are said to have torn down the old panelling in one of the rooms for firewood. A chapel at the north side of the house was also destroyed by fire. Warnham's parish workhouse was just south of the church and on the same side of the street. County of Sussex: Horsham (6), Ifield (2), Itchingfield, Lower Beeding, Nuthurst, Rusper, Shipley (2), Slinfold, Warnham (2), West Grinstead (2). The population falling within the union at the 1831 census had been 12,270 with parishes ranging in size from Itchingfield (population 356) to Horsham itself (5,105). The average annual poor-rate expenditure for the period 1833-5 had been £14,068 or £1.2s.11d per head of the population. 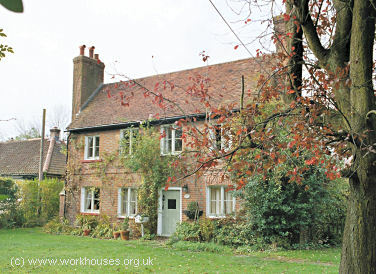 Initially, the new union made use of existing parish workhouse accommodation at Horsham, together with the old Shipley parish workhouse being used for children, and Warnham parish workhouse for the aged and infirm. A new union workhouse for 250 inmates was erected in 1838-39 at the south side of the Crawley Road in Horsham. It was designed by the London-based partnership of Hallett and Newman who were also responsible for the workhouse at Linton. The site location and layout of the Horsham building can be seen on the 1903 map below. 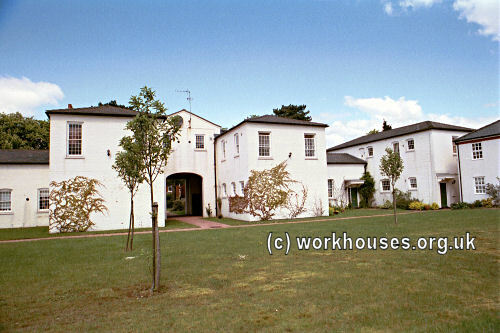 The workhouse was built around a central courtyard. The entrance block at the north had a central entrance archway. Horsham entrance block from the north-west, 2001. Horsham rear of entrance block and courtyard from the south, 2001. In 1900, a new infirmary block, designed by CH Burstow, was built to the west of the workhouse. Horsham infirmary block from the east, 2001. After 1930, the former workhouse later became Horsham Public Assistance Institution and was used to treat military casualties during Word War Two. After 1948, as Forest Hospital, it provided care for patients with severe learning disabilities. The hospital closed in around 1990 and the buildings have now been redeveloped as residential accommodation. 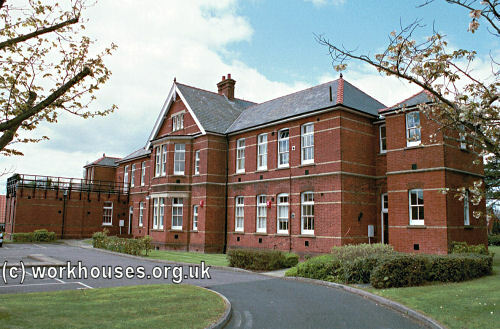 By the 1920s, the Horsham Union had established a children's home at 5-7 Bedford Road, Horsham. 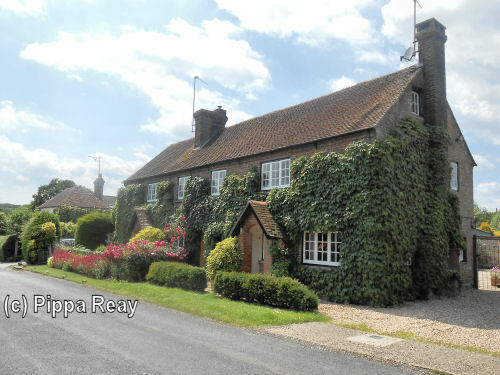 In 1924, it could accommodate 19 children, with Miss P. Busby as its Superintendent. The property is now in private residential use. West Sussex Record Office, County Hall, Chichester, West Sussex PO19 1RN. Holdings include Guardians' minutes (1835-1890); Births (1914-35); Deaths (1914-39); Creed registers (1914-31); etc. Hickman, M.M. (1944) Rules for the Paupers in Shipley Poorhouse in Sussex Notes and Queries, X, 35-36. Thanks to Pippa Reay for the Shipley photo.